It was wonderful Lauren, such a brilliant read and passionate characters. I highly recommend it. This sounds like I'm going to want to just sit and hug the book once I've finished reading it, squeal uncontrollably and then tell my mum she has to read it - kinda like when I finished Clancy of the undertow, The sidekicks and Simon and the homosapians agenda. YES! It's exactly that kind of read Sarah. It's just so lovely but with so much depth of character. I'd love to see what you think of it. So glad to hear you loved this Kelly I am going to be giving this a read soon and I can't wait! And it's an own voices author too Anisha. I loved Delilah, she's such a passionate young woman who wears her heart on her sleeve. I can't wait to see what you think of it. Dammit, it doesn't come out until April here, and it has a different title "Get It Together, Delilah!". I reeeeally want to read this! I didn't know it was being released in the US Christy, that's incredible news! Such a wonderful read, the little guy fighting big corporations, the tribulations of being a teen. It's such. Brilliant read. Can't wait to see your thoughts. I love love LOVED it! I'm kicking myself that it took me so long to read it though. I actually thought the same Shannon. The cover is lovely but it looks very young. I was thrilled to hear it's being released in the US, such a wonderful book that I hope everyone has the opportunity to read. ah. not a bad one I think, I will like Delilah. She's a wonderful character Ailyn, I can almost guarantee you'll adore The Flywheel too. Thanks Marianne and I completely agree. I think our young adult in general is really honest and a great representation of how diverse our communities are. 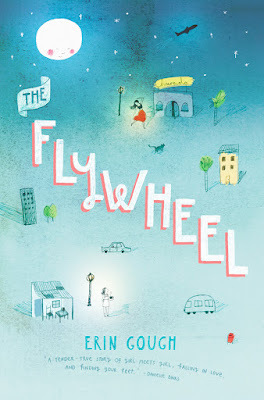 The great news is that The Flywheel is being published in the US. Hooray! Delilah sounds lovely, utterly lovely and complicated. And, I can appreciate that the author makes the parents' presence felt even though they're not there. It's too often that parents are sort of written off in YA I find. Charlie lol he sounds like the best BFF! Charlie was adorable, part of his charm being a skirt chaser is that he loves women and it makes for so many amusing scenes. Delilah is just such a likable character, amazing book Verushka. This sounds pretty delightful. I may not be reading a lot of YA lately but I do want to read this, I'll have to pick up a copy. I *love* that cover, so it's going to be a paperback one :D yay books! It's beautiful! Such a wonderful read which is not only diverse, but about the little guy battling big business as well. I absolutely loved it. I actually put this book on my tbr-list last year or maybe even in 2015, and totally forgot about it. Thanks so much for putting it back on my radar. This sounds wonderful. Why haven’t I read it? I think such cute feel-good GLBT stories are no less important than serious ones. I couldn't agree more Ksenia. That's what I love about Aussie young adult, it's so diverse without making a big point of being diverse. It's just representative of our communities and wonderfully represented at that. My friend Wendy also enjoyed this one and your review makes me more excited to read it! It's such a wonderful read Glaiza, I would love to see what you think of it.